Have you suffered a broken shoulder or fractured shoulder, due to an accident that wasn’t your fault? If the accident was caused by negligence on behalf of another party, you could be entitled to claim compensation. If your fractured shoulder was misdiagnosed, causing you further pain and suffering then you could be entitled to claim medical misdiagnosis compensation. We are Legal Expert, a trusted advisor. Call us today for a free legal consultation. We can determine whether or not you have a valid fractured shoulder claim, or fractured shoulder NHS misdiagnosis claim, advise you on how much compensation you can claim and match you with the right solicitor to take on your case. So call us today to begin your claim. In this case study, we are going to look at the case of Mr S, whose name we have abbreviated for reasons of privacy. Mr S suffered a fractured shoulder which was initially misdiagnosed, causing him to make an NHS misdiagnosis claim. Mr S was involved in a road traffic accident and was taken to his local hospital, which we will refer to as hospital N, where his shoulder was X rayed. Unfortunately, he was misdiagnosed as having strained ligaments and told his shoulder was not fractured. Over the next few months, Mr S suffered persistent pain which affected his ability to work and sleep. 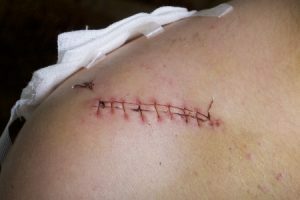 When he returned to the hospital, Mr S saw an Orthopedic Surgeon, who reviewed the X rays taken at the time of the accident, and found that Mr S had fractured his clavicle, also known as the collarbone, connected to the shoulder. How Common are Medical Misdiagnosis Cases in the NHS? Medical misdiagnosis cases are more common than many people think. According to a report published in 2009, nearly 1 in 6 cases are misdiagnosed in the NHS. Although the vast majority of cases of medical misdiagnosis are not significant and don’t cause any serious damage, millions of NHS patients were likely to suffer serious health problems or have existing conditions made worse as a result. The report found the main reason for medical misdiagnosis in the NHS was that doctors were too quick to make judgements and were reluctant to ask more senior colleagues for help. To avoid patients becoming necessarily injured in medical misdiagnosis cases and being sued for NHS misdiagnosis compensation, the NHS must take care to avoid these cases at all costs. As we have already mentioned, reviewing the initial X-rays showed that Mr S had fractured his clavicle at the time of his accident and this had initially gone undiagnosed. In the months between the misdiagnosis and the correct diagnosis, Mr S’s injury had failed to unite which required surgery. After surgery Mr S made a reasonable recovery, however, had Mr S’s broken clavicle been correctly diagnosed, the fracture would have united without surgery, reducing his broken shoulder recovery time, and he would have also avoided the pain and suffering he endured before he received the correct treatment. A claim on behalf of Mr S the Claimant was bought on the trust of Hospital N. The basis of the medical negligence claim was that the fracture was misdiagnosed and the failure to refer Mr S to the fracture clinic caused the Claimant unnecessary pain and suffering. What’s more he required surgery that would have been unnecessary if his diagnosis had been timely – and would have improved the broken shoulder recovery time Mr S experienced, dramatically. The case went to court and Mr S was awarded £10,000 in NHS misdiagnosis compensation. Have you suffered fractured shoulder symptoms, broken shoulder, fractured joint or a broken or fractured clavicle? Then you may be able to claim compensation for your injuries. Let Legal Expert help you make your claim. If your shoulder injury was caused by an accident that wasn’t your fault, be it medical misdiagnosis, a road traffic accident, accident at work or an accident in a public place, you could be entitled to compensation. Call us today on 0800 073 8804 to speak to a friendly advisor, who can determine whether or not you have a legitimate accident claim case, the compensation amount you could claim and they can match you to a personal injury solicitor who specialises in fractured shoulder claims. Call today, to begin your compensation claim case. If you have suffered from fractured shoulder NHS medical negligence, or a fractured shoulder or a related injury in an accident that was not your fault, consider using a no win no fee solicitor. Legal Expert can match you to an expert personal injury solicitor, who offers a no win no fee service. This means that you will only have to pay your fee, if you win your case, meaning less financial risk for you. If you would like to claim for a fractured shoulder, or fractured shoulder NHS misdiagnosis compensation call Legal Expert to begin your no win no fee claim. Help and advice for claimants who were victims of medical negligence including NHS medical misdiagnosis. Compensation claiming advice is also included.